For the whole of the past 1 month (or was it 2 months??? 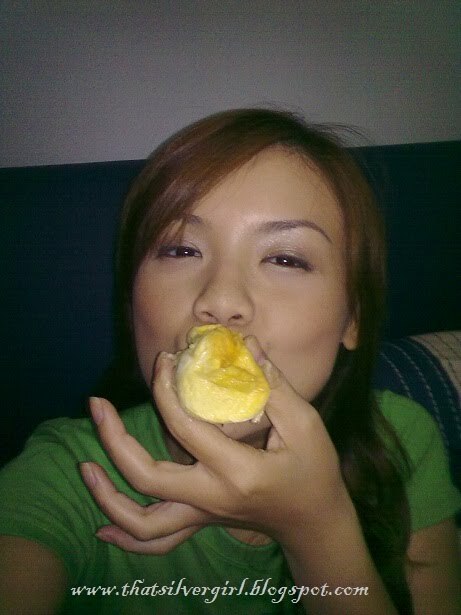 ), I have been binge-ing on durians every other day. 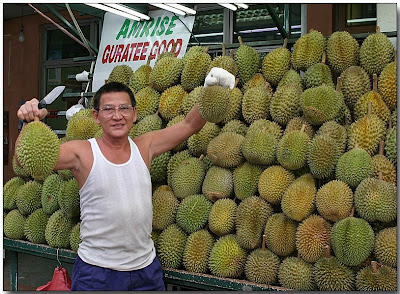 Like, Sunday I would eat durians, then Wednesday I would eat it again, and Saturday you would catch me at NTUC or Giant buying my 3 for $10 (actually it's 3 for $9.95) durians!!! And don't laugh at NTUC/Giant durians okay, if you know how to choose, they can taste better than the 1-for-$35 kind! 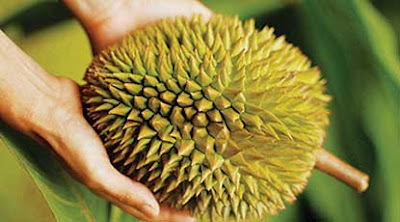 For the non-Asians who have no idea what durian is, it's a fruit which you either love or hate, due to its very pungent smell. I think it's an acquired taste, like blue cheese. It's got thorns all over its husk, and when you open it up, you eat the yellow fruit inside. 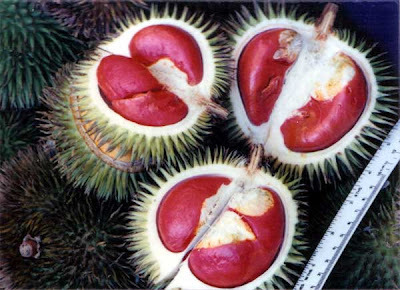 It's revered all over Southeast Asia as the "King of Fruits". They look somewhat like Jackfruit, also a tropical fruit, except that it's spikier. The fruit is soft and slightly sticky, sometimes mushy (I hate the mushy kind!). Not like your usual watery fruits, for sure. The smell is also very pungent once it's opened. Those who don't like it will say it stinks. Those who love it (me) loves the smell~~~smelling it would signal that my favourite fruit is nearby! 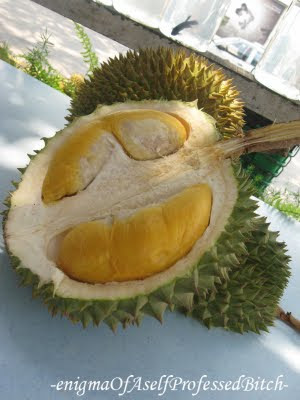 I was googling about durian and I found out that other than having high protein content, durian also contains very high levels of Organosulfur Compounds and Tryptophan. Not sure what it means? Organosulfur compounds decrease the synthesis of cholesterol by hepatocytes (liver cells). Someone once told me durians are very high in cholesterol. I guess my findings overturn that statement. Organosulfor also enhances beautiful complexion, mineralizing hair, and glowing skin. No soreness in any muscles after vigorous exercise and better brain function. 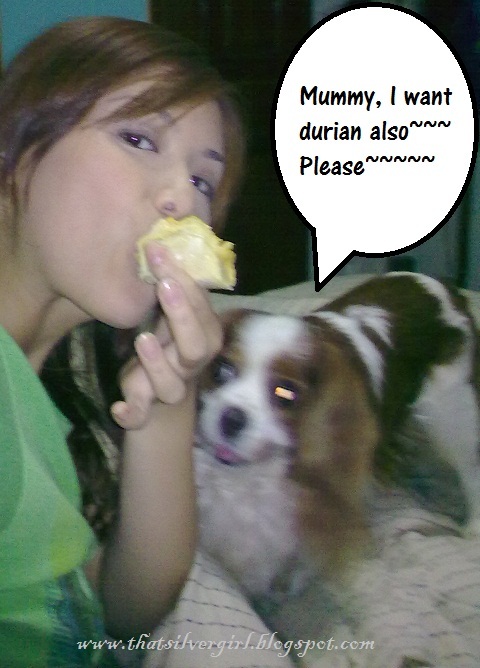 More reason for me to eat durian. Good for the skin!!!!!! Tryptophan? I'm sure many of you have come across this word. Don't know what it is still right???? Confirm. So many of us are so bochup that we see a word we don't know, we ignore and don't lookit up, so that 3 years after seeing it, you just take it that it's a word you don't know so it remains unknown to you. Let me clear up for you what Tryptophan is. Tryptophan is one of the 10 essential amino acids that the body uses to synthesize the proteins it needs. And what can high tryptophan foods (like durian) do for you? Good hor!!!! So durian keeps you healthy, makes your skin nice, makes you happier and thus a nicer person to be around so you'll have more friends. Can eat durian to lose weight and curb over-eating too!!! Wah!!! Then it helps with your PMS so you're less bitchy, and it helps you concentrate better so you get your work done better so you land that promotion sooner. And if a friend is feeling depressed/suicidal, bring them for durian. Aiseh!!!! I never knew my favourite fruit is a great multi-tasker leh!!!! Woots!!!! While googling, I realized there's more than just D24, D16, 猫山王 and XO. Click here (open in new tab la~) to find out about the different species. 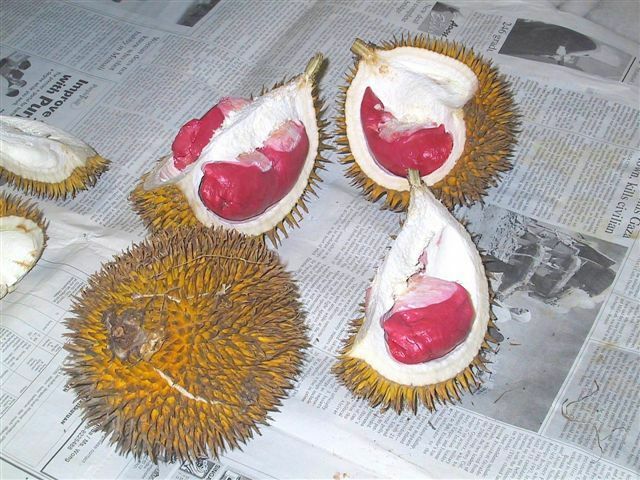 Okay, if I'm going to Sabah, I will try the red durians. I just found out that it exists, but can only be found in Sabah (Malaysia). Apparently, the smell isn't as strong, and as described by this guy called Drizad on his blog (open in new tab la!!!) , is "almost odourless and tasteless", and "tasted really bland". For now, the original cream/yellow-coloured one will suffice. Yums~!! !